The team at We Are Chester love anything to do with food and so when we received an invitation to sample the new Odd Plates menu at Oddfellows in Chester, we could not refuse. Paul Crofts went along to investigate. In the centre of Lower Bridge Street stands the imposing edifice of Oddfellows Hall, originally a town house built in 1676 for Lady Mary Calverley. The building was the first in the centre of Chester to be designed in classical style. During the early 18th century the house was occupied by John Williams, a local Attorney General. Since that time the building has been used for various purposes, including most recently The Royal Naval Association Club, of which I have very fond memories but, that’s a story for another day. Today, Oddfellows provides something of a hidden oasis of calm away from the hustle and bustle of the city centre and has established a reputation for fine food, elegant yet quirky surroundings and excellent service. I was joined for lunch by Cathy, a friend of many years. We were quickly shown to our table in the light and airy dining area, situated in an extension the original building. We were greeted by our waiter who explained a little about the Odd Plates menu before taking our drinks order. The menu had been created by head chef Elliot Hill who told me about the concept behind it. Elliot explained: “We’ve constructed the Odd Plates concept for a number of reasons – first and foremost it’s about the diner and their experience, the menu provides flexibility offering a contemporary way of eating. “Diners can have a selection of smaller plates or one larger plate to suite their preference. With that in mind, each dish is designed and inspired by the ingredients. Elliot prides himself on sourcing top quality local produce so that the journey from field to fork is a short as possible and so the menu will evolve with the seasons. Odd Plates offers some mouth watering choices including cod loin, sea bream, poached pigeon breast, cornfed chicken and pork tenderloin, with some of the portions being small plates and some large, hence Odd Plates, giving you the option to choose to have a combination of plates if you wish. As Cathy was on her lunch hour, we opted to choose one plate each, cornfed chicken, tenderstem broccoli, peanut and black lime sauce for me and duck breast, pineapple, rum and ginger for Cathy. Our drinks swiftly arrived and we soaked up the relaxed atmoshere in the garden room, watching as cake stands laden with all manner of scrumptious looking sandwiches and cakes were whisked past us as patrons indulged in afternoon tea, another reason for a return visit! Our food arrived, beautifully presented and looking very very flavoursome. My chicken was so succulent. The skin had been left on and was so light, crispy and full of intense flavour with just the right amount of saltiness adding to the overall experience, just like the perfect Sunday roast. The tenderstem broccoli was just the right side of al dente for me – I hate over cooked, soggy veg. The black lime sauce was lovely and rich and provided the perfect accompaniment to the chicken. Cathy’s duck was perfectly cooked, I stole a bit from her plate, (purely in the interests of this review you understand) and I can confirm it just melted in the mouth. Accompanying the duck was a duck spring roll which Cathy said was delicious and full of meat, a real hit. Cathy had to sadly head back to work but as I didn’t have any such worries, I decided to opt for dessert and wasn’t disappointed. 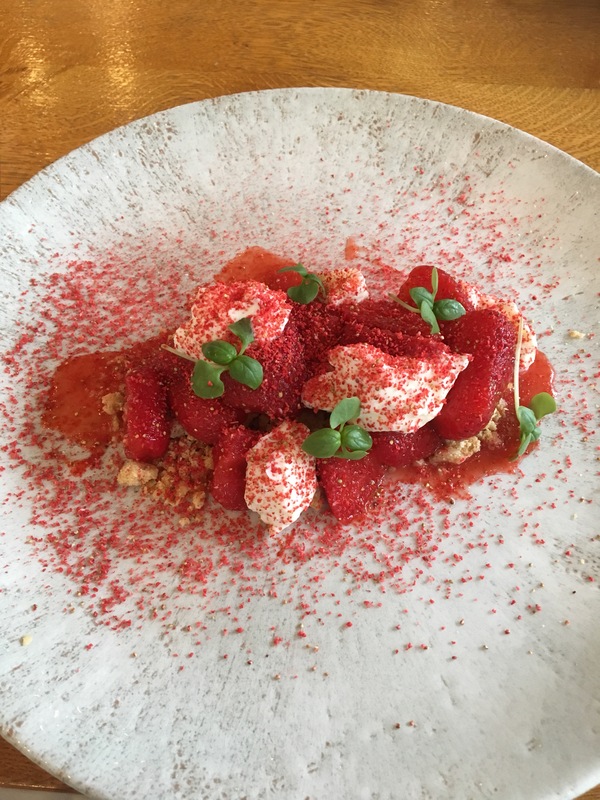 Faced with a mouth watering choice of desserts including an ice cream sandwich and a chocolate cremeaux with salted caramel, I was sold on the macerated strawberries which were beautifully presented as a sort of deconstructed ginger and syrup crumble. The dish was served with a helping of whipped cream and crushed baked yoghurt, scattered like moon dust on the plate to add to the overall appearance and texture of the dish. It was truly scrumptious, the ginger of the crumble coming through enough so as to not overpower the delicate strawberries. The cream was light and fluffy with just the right amount of sweetness. I loved the addition of baby basil leaves which added to the combination of flavours, it really did work. I rounded my leisurely lunch off with a pot of tea, served in the most fabulous vintage tea pot with a bone china cup and saucer, a really classic piece of presentation to match both the wonderful surroundings and exemplary service. The Odd Plates lunch/early evening menu represents excellent value at £17.50 for 2 courses and £23 for 3. I’ll certainly be back very soon.